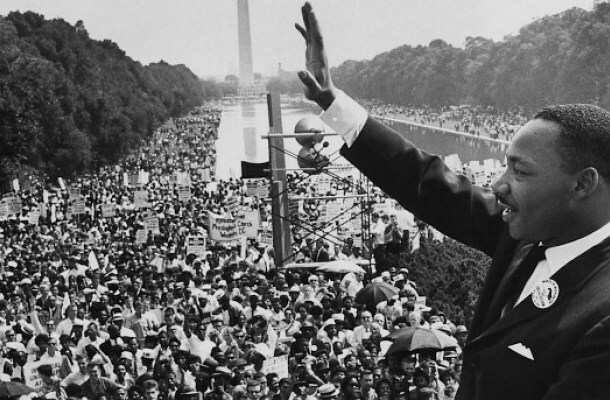 The leadership of Martin Luther King Jr. | The Solar Nerd. Last week I was working with our team in Atlanta and I found myself a few blocks from the Ebeneezer Baptist church and the Martin Luther King Jr. Memorial Center, on the east side of the city. I’ve been through Atlanta many times over the last 15 years, but I’ve never visited the Center. I’d encourage you to go, there are several excellent displays and a comprehensive documentary that you can watch in the theater, at no charge. I spent 3 hours there, then walked through the birth home of MLK Jr., and bought a book entitled: Great Speeches of African Americans. The book starts with speeches given by abolitionists in 1843 through the Civil Rights movement, up to Barack Obama’s commencement address at Knox college, delivered in 2005. You can not call yourself a true student of leadership or history until you have delved into this dark chapter of our collective past. I have tremendous admiration for the brave men and women who risked life and limb to change society for the better, they could have stayed home and played it safe, but they choose to go out and face police in riot gear armed with tear gas and Billy clubs. It’s been over 50 years since Martin Luther King Jr. delivered this speech on the steps of the Lincoln Memorial. It was broadcast across the United States, and represented a turning point in the Civil Rights Movement. The genius behind “I Have A Dream” is not just in the creative imagery, but also the scope of MLK Jr.’s vision for the future. When he stood in front of the Lincoln Memorial in 1963 the American South was embroiled in violent racism; lynchings, bombings and open murder against African Americans, even on camera in front of a network television audience. Despite all of the darkness and evil surrounding him MLK Jr. saw a future that was brighter for his children’s generation. He knew that he was in the crosshairs of evil, daily death threats were leveled against him, yet he saw the Civil Rights movement as something far larger than his own physical well being. He had been stabbed by a demented woman in New York in 1958 at a book signing, narrowly escaping death. MLK Jr. died for his cause in 1968, shot on a hotel balcony by James Earl Ray, an ex felon, pornographer and racist who had worked on the George Wallace political campaign that openly supported segregation. In many ways Martin Luther King Jr. led his entire life as an act of love towards every future minority in the United States who would have to face racism, prejudice and unequal treatment… merely because their skin is darker than others. We are all just varying shades of brown, really. There are still ingrained problems with racism in our country, if Barack Obama were 100% white I feel that his opposition would have a different tone altogether. I do not agree with all of our President’s policies, but I still accord him the respect due to his office. There is still violence and hatred in our inner cities, from Baltimore to Ferguson. There is still redneck police brutality, matched in kind by rioters ready and willing to burn down businesses in their own neighborhood. There is still generational poverty and ignorance, on both sides of the racial divide. If you are an educated person you can help roll back that ignorance by reading and studying this era in our history and telling others about it, you can shine your light into the dark corners of hatred and do your part to eradicate it forever. In our own actions we can seek to understand and love others, just as Martin Luther King Jr. did during his brief lifetime here on earth. ← The integrity of Toyota.